Callie is a special girl ~ we tell her that each and every day. Callie is an epileptic and suffers from severe, multiple (cluster) seizures. She came into rescue when she was only a ten-month-old puppy and had been suffering from seizures shortly after birth. Her family was unable to provide the medication and environment necessary to monitor this little girl. Medications have lessened the frequency of Callie’s seizures, however, she continues to have grand mal seizures several times a year. Callie is a happy girl, however, the violent seizures have taken their toll and she has suffered neurological damage. She remains an active and silly Siberian, however, will stumble often or fall over when just standing and has a slight delay in reacting. This doesn’t slow our special one down a bit! 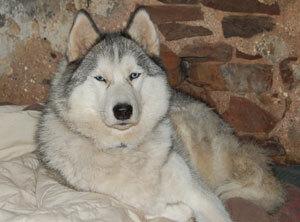 Callie is now four years old and has become a permanent member of the MaPaw family. She delights us in her antics and we celebrate each seizure-free day. She is in a foster home where she can be monitored closely and has a wonderful canine neurologist, Dr. Jerry Northington of Metropolitan Veterinary Associates. We have learned so much from Callie ~ never feel sorry for yourself, enjoy life to it’s fullest and pick yourself up when you fall. We are so happy we are able to care for her and provide her with a safe and happy life. Callie is now 8 years old and has been in our rescue for seven years. We are so happy to share the news that she has been seizure-free since October 2010 – great job Callie! !In 2013 she had one seizure and is back to her old self. She is presently on Zonisamide (9 per day) and we are so happy it is helping her. She remains our happy, goofy girl that makes everyone smile and she is loved by all of the dogs. She has claimed the large (unused) fireplace in the MaPaw office as her day “crate” so we accommodate her with large fluffy comforters (no woodstove for us!) Please send sibe vibes that Callie continues to be seizure free and the medication continues to work for her.